A large bull moose feeds on willows on an August morning. 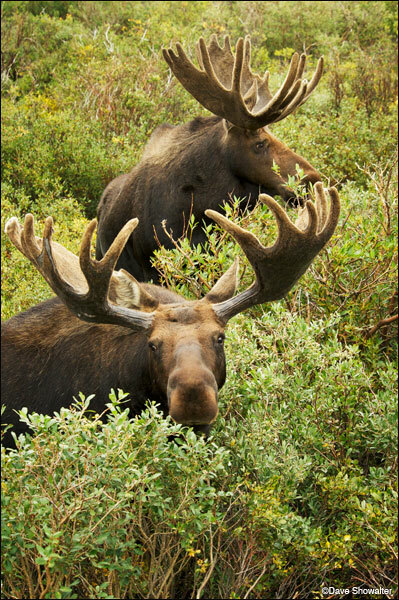 Moose have just recently migrated to the eastern side of the Continental Divide along the Front Range, long favoring the wet side of Rocky Mountain National Park. On this morning, I watched a bachelor group of six large bulls feeding in the willows. There’s a bachelor group of very large bull moose on the Front Range, magnificent creatures all feeding in harmony until rut starts next month, when they’ll battle for the right to mate. For now the bulls are fattening up on willows before they spend a lot of energy during mating season. 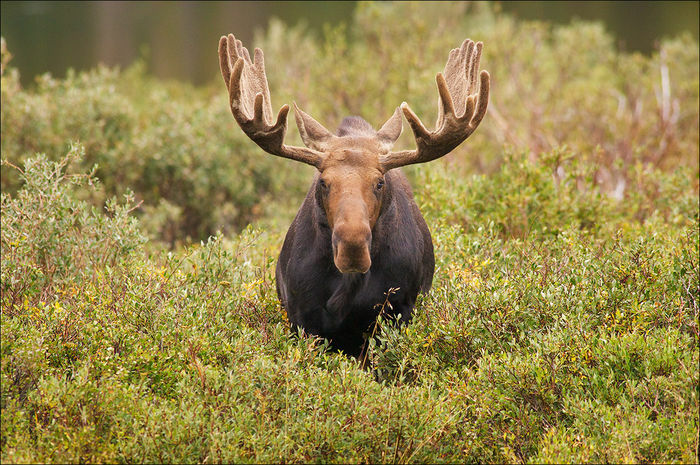 Moose were a very rare sight on the eastern side of the Front Range until the last few years; you had to go over to the Kawuneeche Valley in Rocky Mountain National Park or Arapaho National Wildlife Refuge to have a decent chance of spotting moose. Cow sightings are now common near Estes Park and I’m hopeful that the rut will happen in the general area where I photographed today. The photo experience included an 8 foot step ladder with my Kirk window mount on top, turning the whole rig into a “ladder pod.” Without the ladder, I’d just be looking at antlers sticking out of willow; you can only make so many of those abstract moose images. I used a Nikon D3s camera body, which has great low light capability and both a 600mm lens and an 80-400mm. The moose passed right by me and two other photographers on their way to the forest – next time I’ll have a wide angle lens in my pocket. What a thrill! A pair of large bull moose feed on willows, their favorite food source. Moose have long favored the wetter west side of the Rockies, but some have recently migrated to the eastern side of the Front Range. I observed six bull moose in a bachelor group this August morning. A pair of bull moose browse in willow on a late summer morning. Posted in Colorado Mountains, Photography on August 20, 2012 by Dave Showalter. Great shots, love the moose looking up at you! Oh alright, I’ll carry your ladder while backpacking…. Just wondering, do they make a carbon fiber ladder pod and whats the folded length of those things? That would sure help Marl. Does Marla have a sister or cousin around, I may buy one of those things?